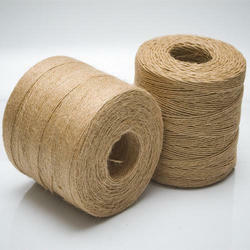 We are Manufacturer & Exporter of Jute Yarn. These are available in various specifications to suit customer needs. Winding in cylindrical/conical /coneless spools or hanks is done as per requirement. Our jute yarn finds extensive applications in carpet industry, cable industry and for multiple other usage. These are also available in bleached dyed and blended jute yarn in different colours and compositions. Make-Up : Plastic & Paper cones & tubes ( Parallel Spools).